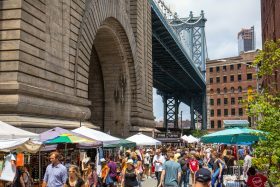 With outdoor weather finally here (more or less) the city’s flea and food markets roll out the red carpet and the irresistible goodies, and it’s pretty likely there’s one happening near you. From the unstoppable fashion-and-foodie mecca Brooklyn Flea (now in its ninth season), to a night market in Queens and a neighborhood favorite in Park Slope to antiquing standbys in Chelsea and Hell’s Kitchen and the humble (but fun) stoop sale on your block, the goods may be odd, but they’re out there. 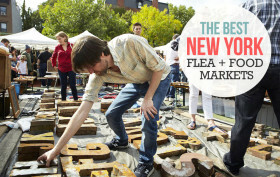 Check out the list below for some of the city’s top food and flea picks. Just don’t blame us for the tchotchke overload–or the calories. Our new series Apartment Living 101 is aimed at helping New Yorkers navigate the challenges of creating a happy home in the big city. This week we explore ten great places to buy affordable, yet beautiful art. 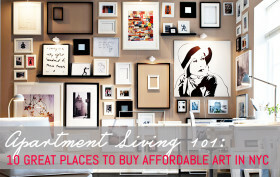 In New York, we spend the bulk of our finances on our apartments, leaving little left in the budget for designer decor. But it can get quite dreary looking at those blank eggshell colored walls for months and months, especially during the colder seasons when we’re stuck inside. So with fall officially in gear, it’s time to kick off the lower temperatures with some great art. 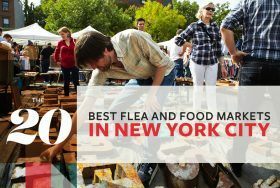 With the cash-strapped New Yorker in mind, 6sqft has put together a list of ten great places–local shops, online resources, and markets–that’ll allow you to give your walls an added boost without breaking the bank. As December dawns, the holiday gift markets roll in, and it’s harder than ever to turn around in NYC without encountering a pop-up shop or makeshift mall offering everything anyone could ever want–whether they know it yet or not–for the body, mind, soul and home. 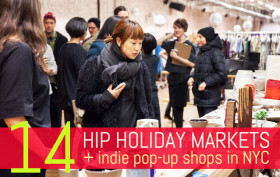 We’ve assembled a list of smaller, cooler pop-ups and holiday markets that mix music, food and fun freebies like haircuts, goodie bags and beer with this year’s selection of clever, crafty gifts.